Another round-up! This one is even bigger and better, and features dozens of the best FindingVegan bloggers on the web. From cookies to gingerbread houses, mouthwatering main means and edible gifts, there’s bound to be something in here for you to enjoy with your family this holiday season. There are some amazing vegan recipes, books, features and more out there on the internet, but it can be challenging to track down great content sometimes! That is where FindingVegan.com comes in. 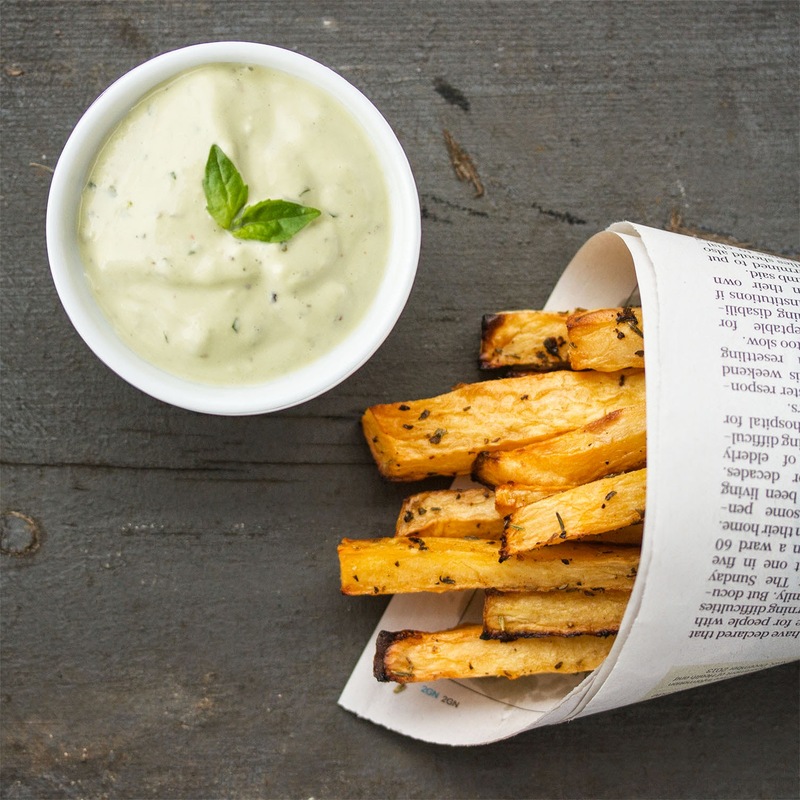 FV features recipes and more from the best vegan-friendly bloggers on the web! And this year, we FV asked some of its contributors to share their best content in a MEGA-amazing vegan round-up! Check out all that is going on in the vegan community!.. 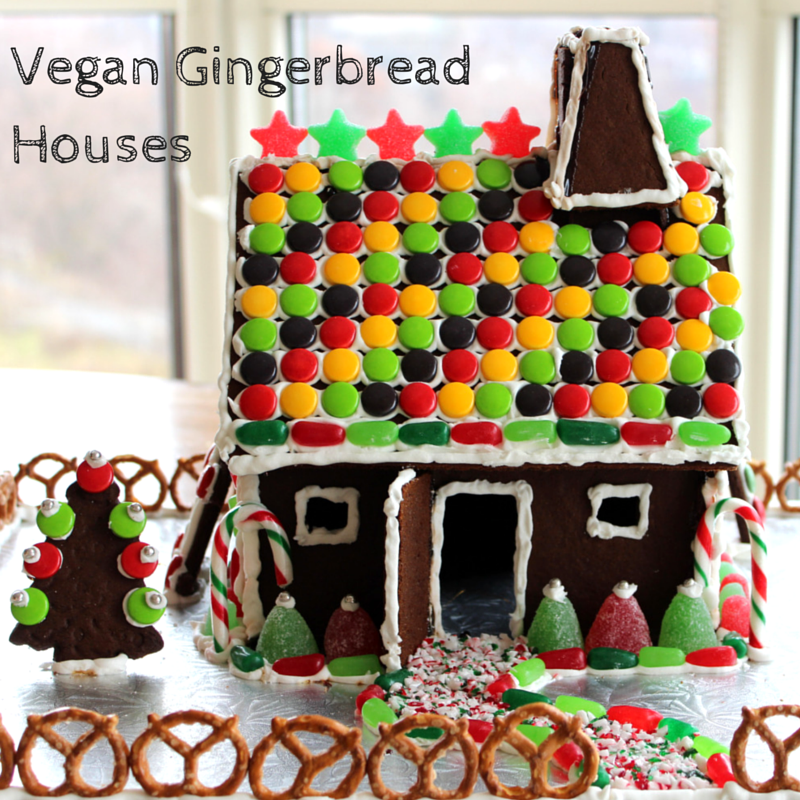 * 12 Days of Vegan Christmas Giveaway + YouTube Series – $2700 grand prize! 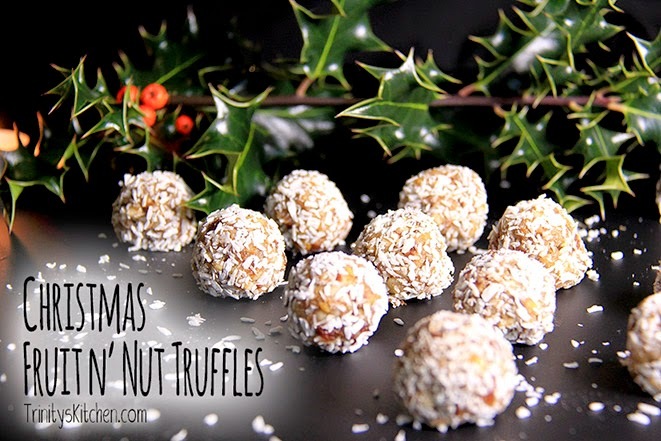 * Spiced Rum Balls – no kidding! * This is a recipe for Garabatos or scribble cookies. These cookies are very popular in Mexico city, and you will fall in love with them too. 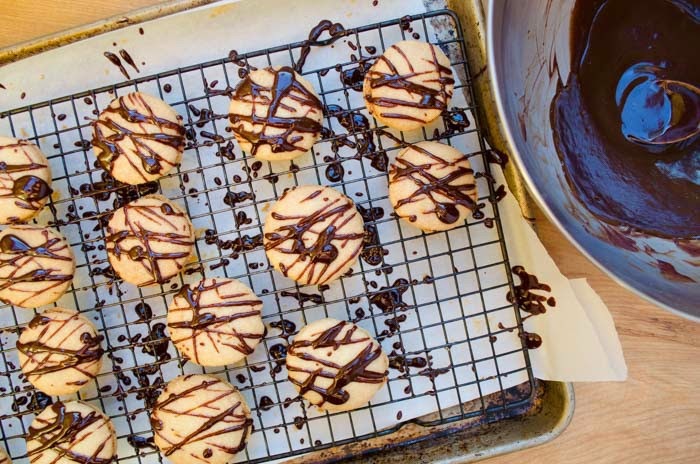 Who can resist two coconut shortbread cookies, sandwiched in a smooth chocolate filing, and drizzled with warm chocolate? The best part, they’re 100% vegan. * How to make vanilla extract – Fun holiday gift idea! 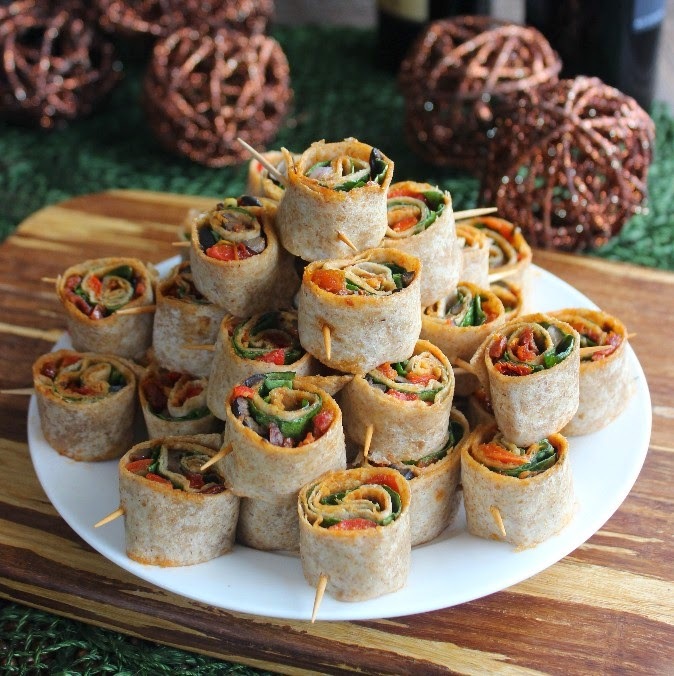 * Sunflower wrap – Healthy holiday snacking! …and SO many more on FindingVegan.com. Sign up for the Finding Vegan Monthly Newsletter here. I wish you all a very merry Christmas! 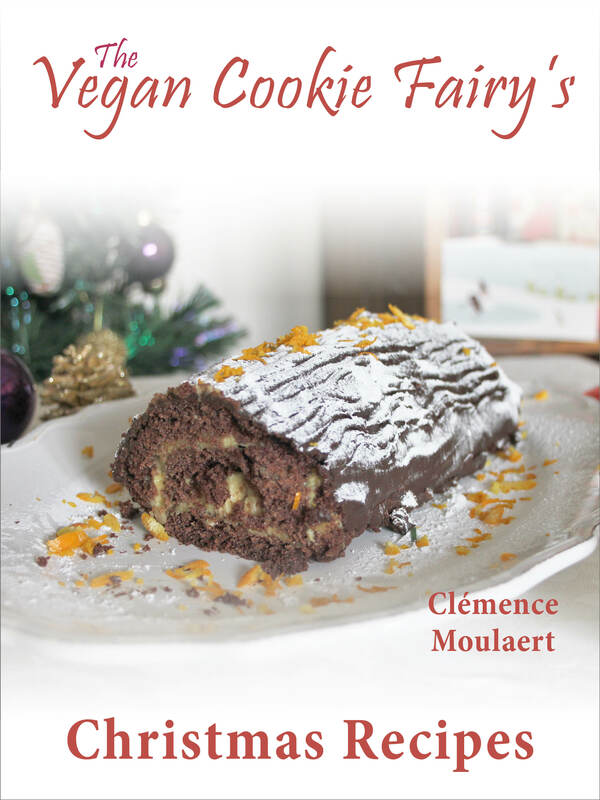 There is one more recipe coming from me before Christmas Day as part of the the Festive Vegan Blog Crawl I’m hosting with Fab, Ceri, Lane and Hedi. 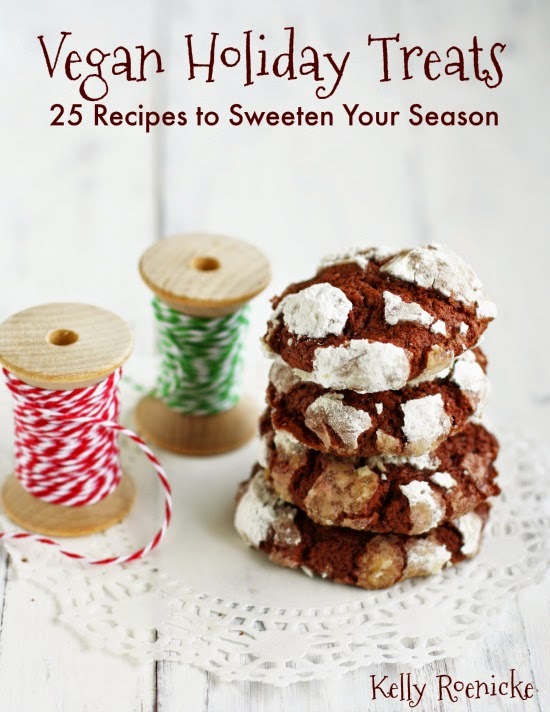 If you need more inspiration for the holidays, just check out their delicious recipes! Psst — there are only 5 days till Christmas! 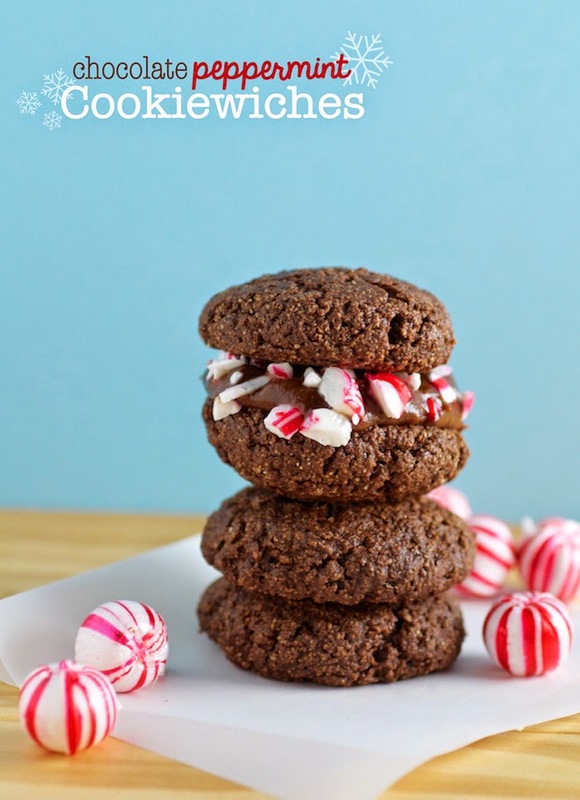 Get my ebook THE VEGAN COOKIE FAIRY’S CHRISTMAS RECIPES on Amazon to have the best vegan Christmas ever. Don’t forget to sign up for email updates and follow me on Instagram, Twitter, Facebook, Pinterest and Tumblr! You can also follow my blog through Bloglovin‘. Is alcohol raw? Probably not. But that’s the only not raw ingredient in this cake, sooo… that doesn’t count, right? I see raw vegan desserts being promoted as ‘healthy’ all the time. Compared to all traditional desserts — laden with dairy, eggs, oil, sugar, white flour, preservatives and chemical food colourings — they arguably are. But dessert is still dessert, and for me, that means it needs to be indulgent, moreish, and 1000% hit the spot. My favourite cocktail is an Amaretto Sour. According to Barnivore, Amaretto is vegan — HALLELUJAH! And a good thing too, because I would have hated to give it up. I love the sweet and sour combination, and that almond aroma that reminds me of amaretti with every sip. This cake is not inspired by that blessed cocktail, but simply by the liqueur. 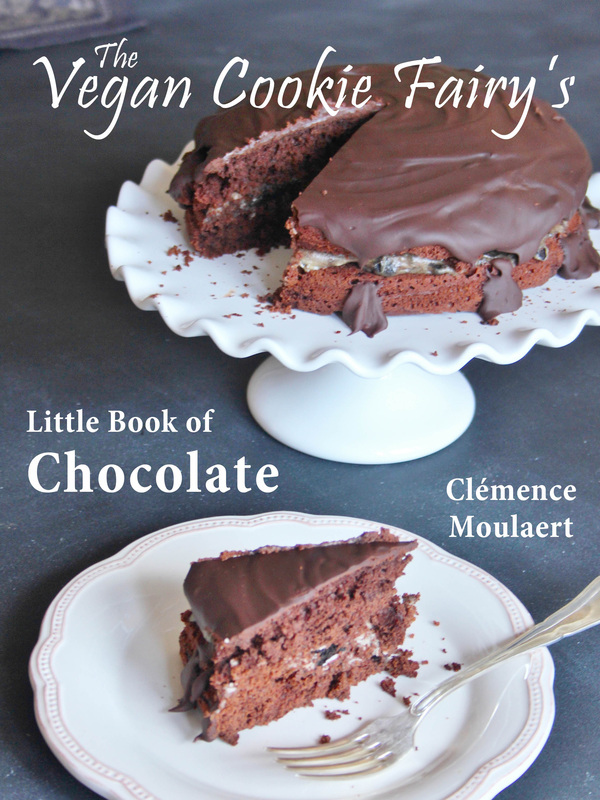 The sweetness of the almond liqueur paired with the bitter cacao, mixed with cream cashews makes for a heavenly cake. You will not be able to stop at just one slice! 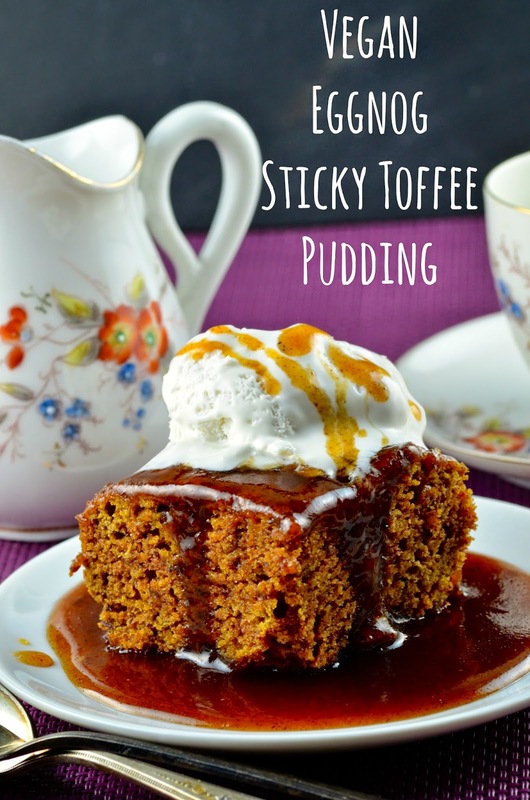 This recipe comes at a particularly happy time for me because tomorrow, I am graduating from the University of Stirling. I am proud to call myself an alumna of this amazing institution; I only spent a year there but it has been the best year of my life so far. I’ve made lifelong friends who share so many of my interests, it’s like I’ve known these girls for ever, I’ve learnt a ton of things, both in the classroom and outside of it, and though there have been lots of earth-shattering, terrifying episodes where I seriously questioned my ability to be an adult, I do feel more confident being me now. It takes me by surprise some days, but I’m proud of myself. I’ve come really far. So tomorrow I am going to pose for hundreds of pictures, have lunch with my parents, catch up with my Dad (who I haven’t seen in over a year), and enjoy being on campus one more time. There are exciting times coming ahead, and this is one of the last times I will get to bask in the majesty of Stirlingshire — I don’t want to tell all just yet, just know that I will soon reveal the great news to you! After soaking the dates and nuts, discard the soaking water. I use regular dates, but Medjool are always preferable; they’re also much, much stickier, so you may not even need to soak them. This cake freezes really well; simply slice it and keep it in an airtight tin for up to a month in the freezer. Leave to thaw for 10 minutes before eating, and it’s like an ice cream cake. You’re welcome. 1. Blend the dates and raw almonds in a food processor until they turn into a sticky ‘dough’. Press this into the bottom of a 20cm (8 inch) springform cake tin. Refrigerate until needed. 2. For the filling, prepare a date paste first: blend the dates with 160ml (2/3 cup) of the water, the melted coconut oil and Amaretto into a smooth paste. 3. Now add the rest of the water, the cashews and the cacao powder. Blend until smooth. 4. Pour the filling into the cake tin, over the crust. Smooth over the top with a spatula, and refrigerate to set for at least 4 hours. Place in the freezer to speed up the process. 5. Release from the tin and top with extra cacao nibs or chopped dates. Enjoy! If I ever say something along the lines of: ‘I think I’ll do a PhD/another Masters degree’ feel free to slap me. Never again would I want to put myself in such a stressful position, not unless you paid me really good money. But you know what’s even worse than the stress of assignment deadlines paired with the responsibilities of living on your own? Finding a graduate job. It’s been a super stressful two months since I handed in my Thesis. I had a temporary job at the Edinburgh Book Festival, which was heaps of fun and paid the bills for a month or so, but that’s all it was: temporary. And as my job ended, so returned the sleepless nights, the nail-chewing, the sudden bursting into violent fits of tears, and the terrible eating habits. 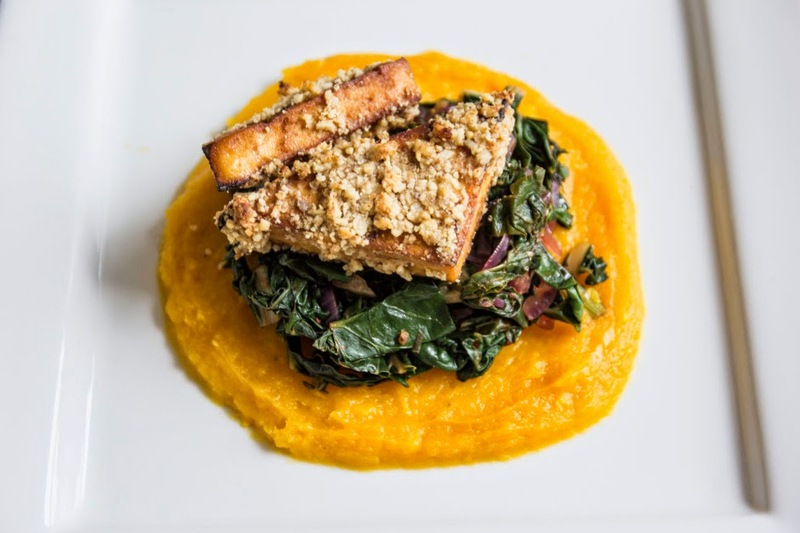 How bad can your eating habits get as a vegan? Fairly bad. Eat-porridge-all day kind of bad, or eat-your-weight-in-chocolate kind of bad. My theme choice for Vegan MoFo 2014 hasn’t exactly helped trim my waistline or keep my acne at bay. (TMI?) I have been known to eat peanut butter cup ice cream for breakfast/lunch/dinner in the past. Healthy fats, sure, but I may have eaten more than the recommended daily (or weekly) serving. 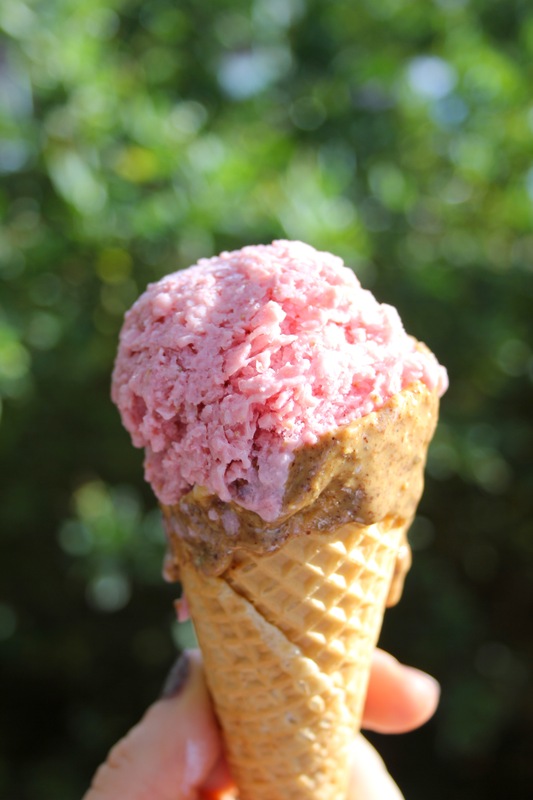 So thank goodness for raw vegan ice cream. It’s just fruit blended with a little raw milk and some superfoods if you feel fancy. It’s actually good for you. Some people on Instagram eat it all day, every day. 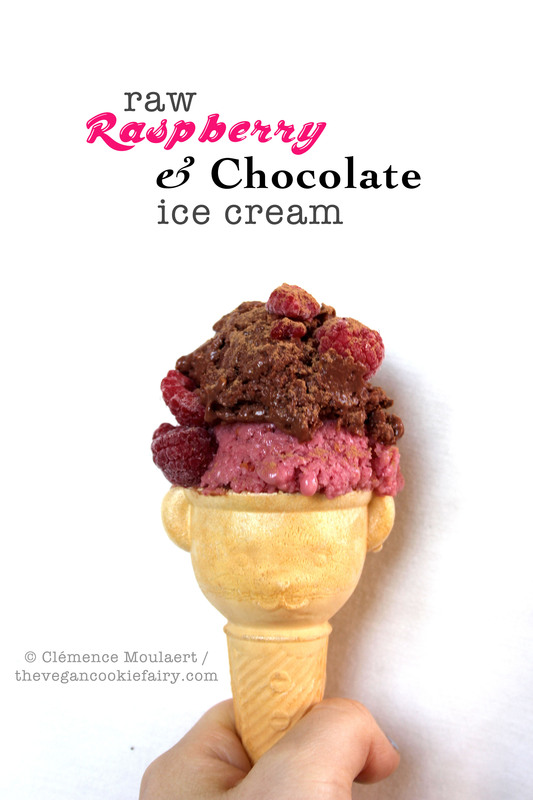 I had this particular cone of raw vegan raspberry and chocolate ice cream (pictured above and below) for my afternoon snack last Sunday. If you’re like me, you probably won’t say no to having a serving of your five-a-day when you’re having breakfast. Note: here is a good recipe to make almond milk. You can use the same method to make oat milk or seed milk. 1. Place the frozen raspberries and milk in a blender and blend until smooth. 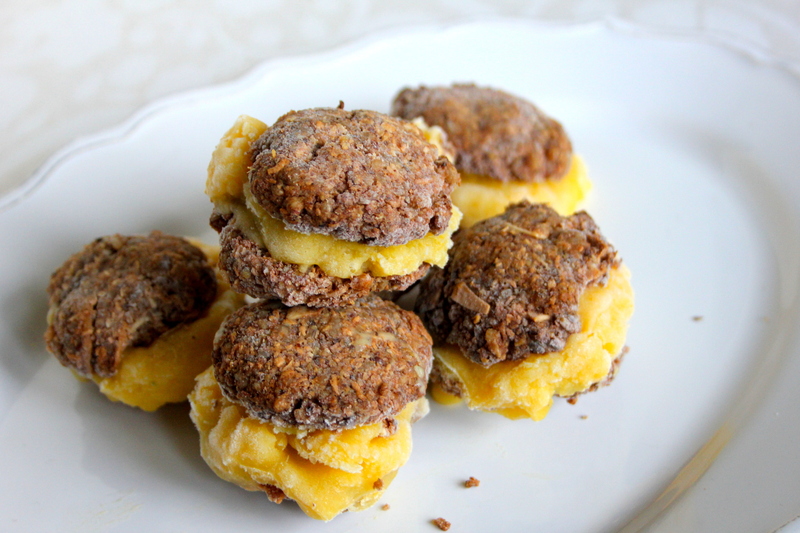 Keep the machine going while you add the frozen bananas piece by piece. Blend until smooth and creamy. 2. Pour half of the raspberry ice cream into a container and place in the freezer for now. Add the raw cacao and coconut sugar (and maca if using) to the remaining ice cream in the blender and whizz again for a few seconds. 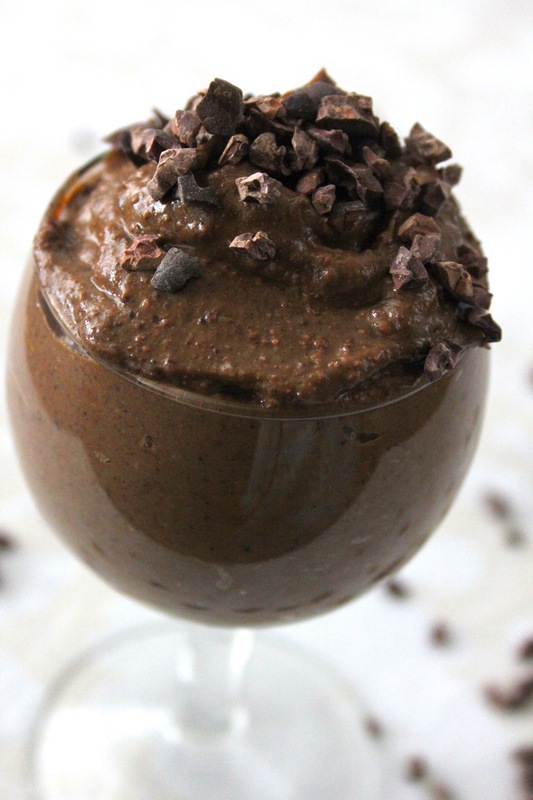 Pour this chocolate ice cream into another container and place in the freezer. 3. Freeze both ice creams for about half an hour, just to set hard enough to scoop into evenly shaped balls. 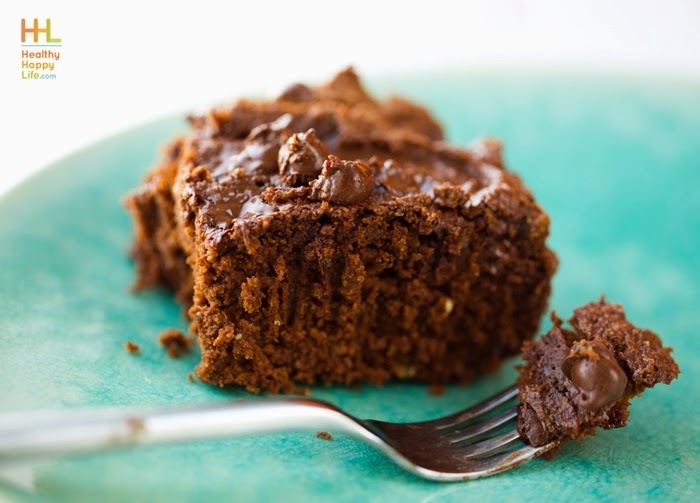 Serve with a bit of cacao powder, raw chocolate sauce and/or extra berries. If leaving the ice cream for longer, take the ice cream out of the freezer and whip for a minute or two every half hour over a period of three hours. This ensures that air is whipped into the ice cream, which prevents it from crystallising into a hard block. What’s your worst eating habit? 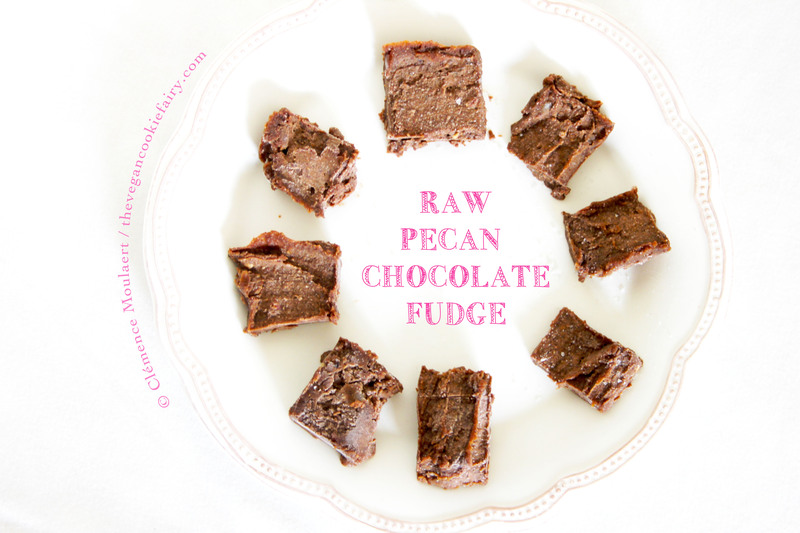 The original recipe for this fudge is called ‘fudge de la Nouvelle Orléans’ but at first I struggled to see what pecans had to do with New Orleans. Until I read this article, that is. Apparently pralines (often containing pecans) were invented in New Orleans, or at least somewhere in the south of the US. And here I thought they were typically French, or at least European. You learn something new every day! 1. Roast the chopped pecans for 10 minutes in a preheated oven at 200ºC (400ºF). 2. Place the roasted nuts in a food processor or high speed blender. Blitz into a powder, then keep blending until the powder starts to become creamy. Add the remaining ingredients and blend a few more seconds until smooth. 3. 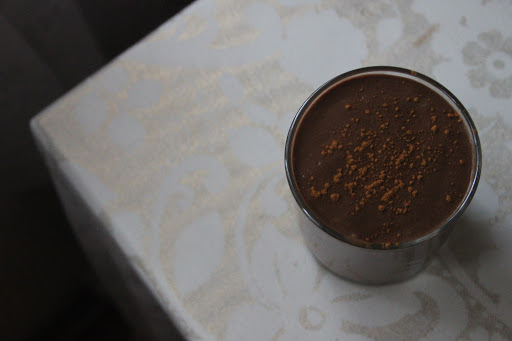 Scrape the mixture out of the blender and press into a small square or rectangular tin. Smooth the top flat. Freeze for about an hour. 4. 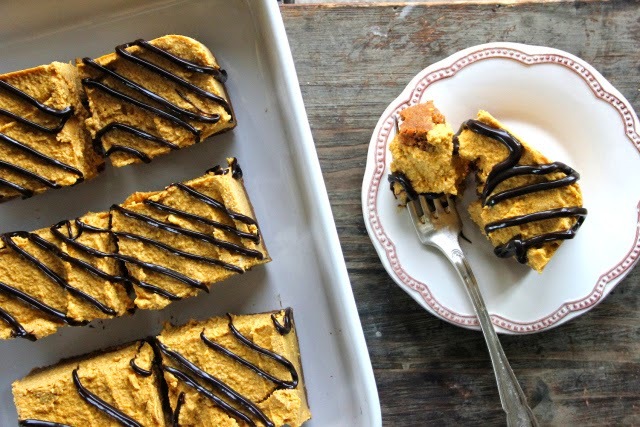 Using a sharp knife, cut the fudge into 20 squares of equal size and shape. Store in an air-tight tin in the freezer for up to a couple of months. Last week I went to England to visit my mum and sister. Going to Mum’s is always a bit dangerous: you know the kitchen is full of chocolate, and most of it isn’t vegan, but oh it’s so so so tasty that I can’t resist. This time I was powerless because on top of having chocolate, she had TWO boxes of big, fat, juicy, gooey Medjool dates. I may have gone a bit weak in the knees. I devoured most of them (sorry, Mum) in two days. Upon our return to London, the Cookie Monster went to market and brought back… more Medjool dates. The bowl was empty by the end of that day. Oopsie. The lesson we have learnt: you should never ever leave me alone with a box/bag/bowl of dates. 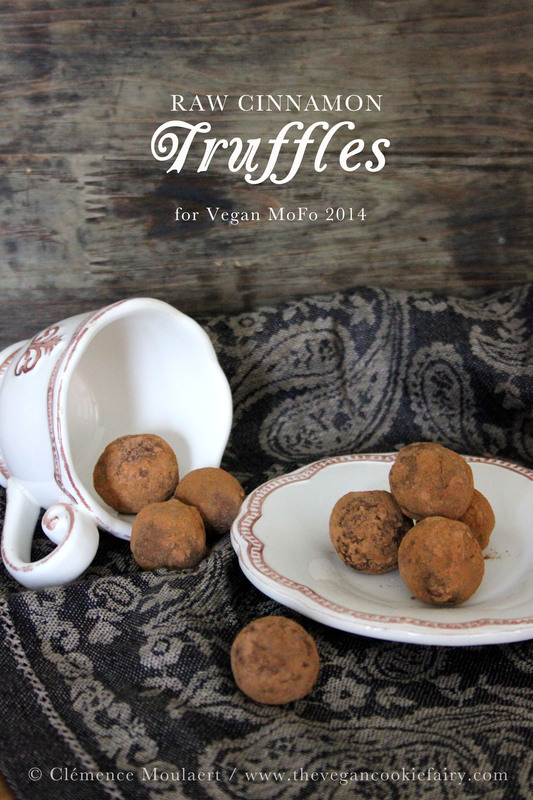 Unless it’s to make tasty raw vegan truffles. 1. Place the dates in a blender or food processor and blitz until transformed into a creamy paste. Decant into a bowl and mix in 1 tbsp raw cacao powder. 2. Roll the chocolate paste into 9 truffles. 3. 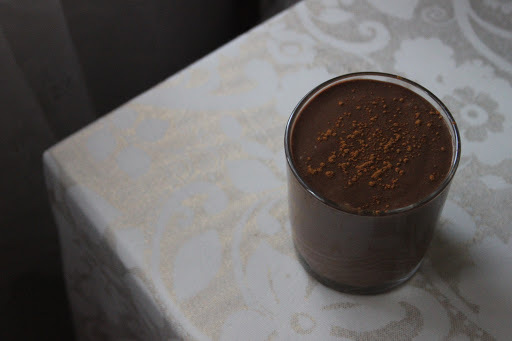 Combine 1 tsp cacao with 1 tsp ground cinnamon on a plate. 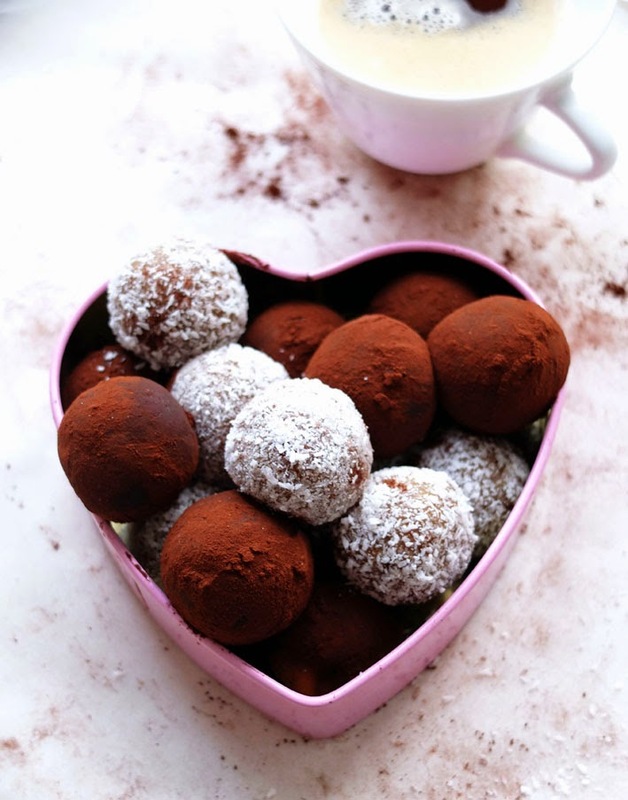 Roll each truffle around on the plate until they are all covered in cinnamon and cacao. Keeps for up to 5 days in an airtight container in the fridge. My Favourite Vegan Summer Desserts – Recipe Round-Up! When summer rolls around I often hear people complaining that it’s too hot to eat rich, sweet foods… Not me! Let’s be honest, there is no alternate reality in which I am not eating dessert every day. Especially in northern Europe where our summers are frightfully short and we have to make the most of our summer fruits while they last, there are all too many excuses to make delectable sweet treats. These are just a handful of my favourite ones – you know it was hard to choose! If you were not yet aware of my love affaire with almond butter, let me tell you about. Or rather, let me show you. 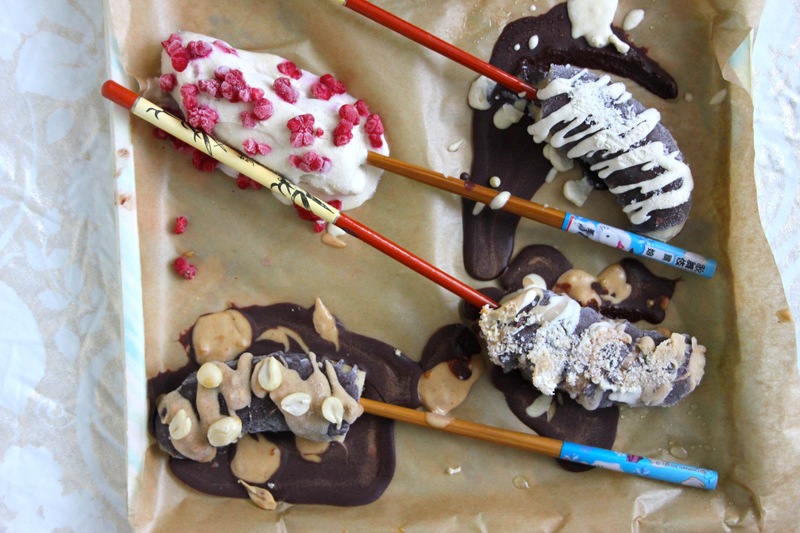 Chocolate-dipped cones haven’t got a chance compared to almond butter. It’s a summery take on the traditional peanut butter and jam combo. I love these Fentiman’s ginger beer bottles, they look so cute and vintage – and the drink itself isn’t half bad, either. The ginger beer paired with the creaminess of the mango and coconut is something you really have to try for yourself. Someone commented on this recipe telling me I must have had sophisticated palate as a child… if only! But if you feel that description applies to you, whether you are old or young, these ice cream sandwiches are for you. They’re much simpler to make than they look! This recipe is amongst my most popular, and it’s easy to know why: it can be made with only 4 ingredients, it’s raw, healthy, and mind-blowingly moreish. Every non-vegan I’ve ever served it to asked for more. If ice cream sandwiches aren’t your thing, have you ever tried a froyo sandwich? I like having these in the freezer for a sweet treat when I get a craving, I just let them thaw for 20-30 minutes before biting into them. Make the most of strawberry season before it’s over! Nothing screams ‘summer’ like strawberries and rhubarb crumble. 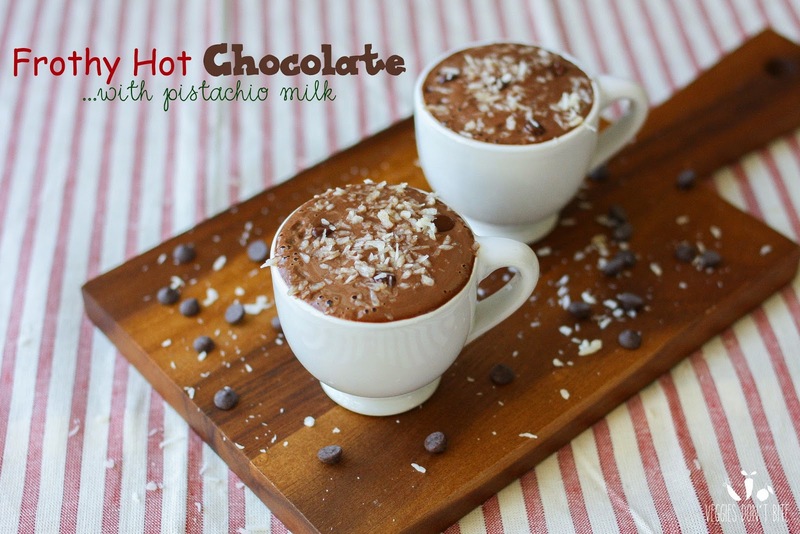 You can easily make this gluten-free by using gluten-free oats, or pulsed nuts and seeds. If it’s too hot to turn the oven on, turn to your Vitamix or food processor and make some raw desserts. Rooibos is my favourite tea of all time, and gives this dessert a delicate perfume. I’ve saved the best for last: super decadent, chunky, indulgent, dreaaaamy peanut butter cup ice cream. Only 6 ingredients, no added sugars. It’s basically one of your five-a-day. The hazelnut milk gives it an extra Christmas-y flavour, something I think we’re all in need of on this foggy, miserable day in London. You can add more or less almond milk to suit your preferences. This smoothie was incredibly thick, almost like a mousse. 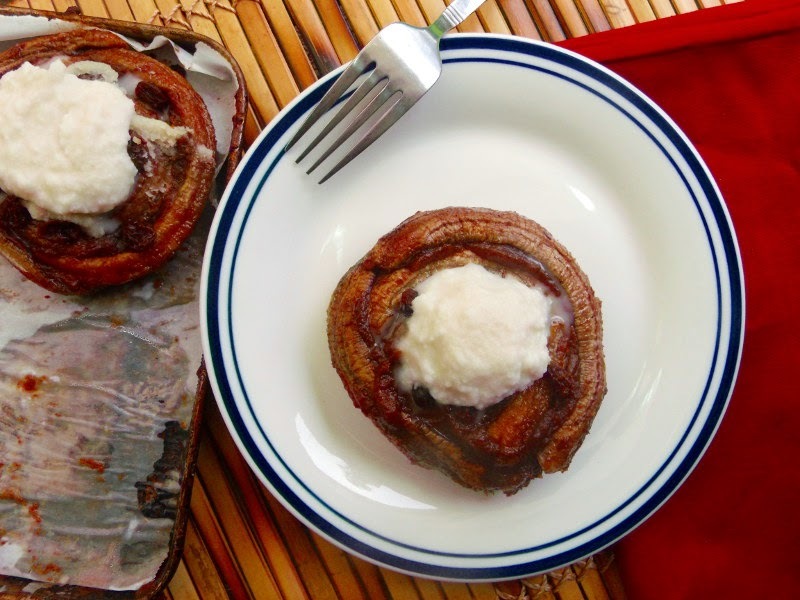 Dessert for breakfast, anyone?